This address delivered by S.N. 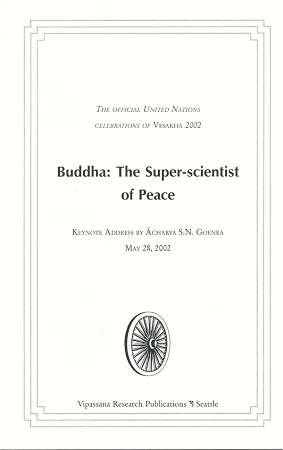 Goenka was delivered at the United Nations on the occasion of Vesakha, the full moon of May, which is celebrated each year as the day marking the birth, the enlightenment, and the passing away of Gotama the Buddha. In 2002, Vesakha occurred while Mr. Goenka was touring North America, teaching Dhamma and giving public addresses in 35 cities over a period of nearly four months.